The Omega D-5 was in continuous production for almost 40 years, making it one of the most popular enlargers ever produced. However, we always found the factory supplied Omega D-5 manual somewhat disappointing - not very well organized, well written, or particularly complete. 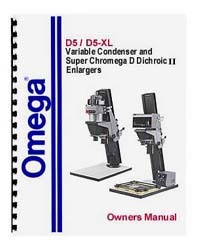 So, we've taken the Omega manual and revised, corrected, reorganized, rewritten and added additional material to make this the most useful and most complete D-5 manual ever available. Whether condenser or dichroic, standard column or XL, this is the best manual for your D-5. This deluxe manual is comb bound so it will lie flat for easy reference, and has protective clear plastic cover pages, front and back. Our revised D-5 manual includes parts diagrams and parts lists for the D5 chassis, DV condenser lamphouse, and Super Chromega D Dichroic II Lamphouse. 8½" x 11" format. Comb bound. 28 pages. Great manual! They did a spectacular job on this.